Aspire Family Mediation Offer Mediation in Northampton. Contact us today to book an assessment! Our office in Northampton is ideal for anyone living in Wellingborough, Rushden, Daventry, Kettering, Corby, Towcester and Rugby. The details of your case remain private, between you, your family and your mediator. Arrangements are agreed in the safety of the sessions and remain within those confines. No involved party has an advantage over the other in mediation. Both sides have to agree to undertake mediation as a solution, and the Aspire mediator is impartial in the process, favouring no one but a fair arrangement. Mediation ends with a decision, one that both parties agree to. You do not need to say you’re happy until you are with mediation. Mediation can be initiated by one party, but both need to be in agreement to proceed with both the process and the decision. This means you are in control throughout.Mediation has come to the fore in recent years, not least because it is a less costly and confrontational way of dealing with divorce and breakups than litigation, and can help resolve issues over assets, property and children in a more satisfactory manner. Since April 2011, it has also been a requirement of some divorces that couples attend a MIAM – or Mediation Information and Assessment Meeting – to try and resolve their particular dispute before it goes to court. If they want to proceed to a court hearing, they must obtain a Form FM1 from the mediator – who must be approved – to present to the court. As a result, mediation has become more widespread and seen as a proven alternative to costly court hearings and legal action over issues that can be agreed in a more amicable fashion. The more relaxed atmosphere of mediation can be especially beneficial for resolving issues surrounding the highly emotional area of children – be it access arrangements between parents, or even grandparents. Mediators are impartial and seek to find the most satisfactory agreed outcome for all, rather than siding with traditional preconceptions of families. The fact that both parties need to be engaged to begin with and also need to agree to the final decision, mean that there is a higher chance of agreement and acceptance of the arrangements. The reduced cost of mediation, compared to litigation, can also be a big factor when children are involved. Similarly, if there are likely to be a number of assets involved in a separation, mediation can again provide a more balanced and impartial process than court hearings. Both parties can leave with a sense that they were listened to and had every opportunity to participate, and that the decision was a mutual one, rather than something taken at a distance that they had no real involvement in, that leaves them feeling resentful towards the other party. Aspire Family Mediators offer qualified and experienced mediators to help resolve your issues, in a manner that will leave you feeling satisfied with the outcome. Whether you are experiencing a relationship breakdown that involves children or assets, or are a grandparent who wants to retain contact with a much loved grandchild, we can help. We also offer mediation within family situations over land ownership, pension arrangements and debt issues, not just between partners who are separating but in more extended family circumstances. 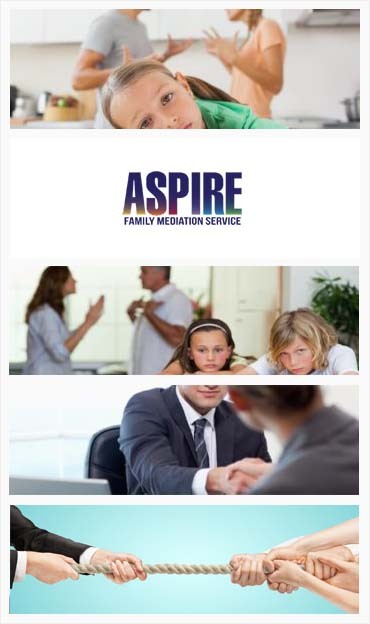 If you are looking for experienced family mediation in the Northampton area, then you really should look no further than Aspire Family Mediators. We are fully qualified and able to undertake MIAMS and complete Form F1 if mediation is not appropriate for your situation. We believe we can help you find a satisfactory solution for your difficult to resolve problems, be they straightforward relationship breakdowns, or more complicated with the involvement of children and assets. Access arrangements, residency, maintenance and support agreements, allocation of property and debt, we can help you come to a suitable agreement on all these issues, leaving you in control throughout. Sometimes, things that are supposed to be good, turn bad. Feelings change, people grow and relationships break down, however decisions need to be made to ensure everyone walks away happy with arrangements over children, money and assets. Unfortunately, such events can be costly and the involvement of solicitors and courts can be both expensive and overly emotional. There is an alternative, however. Mediation is a voluntary arrangement, which both parties agree to enter, and which involves qualified practitioners impartially helping to negotiate an arrangement that is satisfactory for everyone. Aspire Family Mediation are now working in the Northampton area to help people overcome relationship breakdown in a fair, non confrontational manner. When I wanted to end my business partnership with my long time friend, I was confused over how proceed. My dad suggested me to take help from these people and quickly the partnership was ended and the best part is we still are very good friends. I was furious with my husband when I figured out that he cheated on me. I was so hell bent on divorce but then we decided to go for mediation first. I found a lot about myself and our relationship at these meetings and now we are trying once again to make this work. It wouldn’t have been possible without Aspire’s help. These people are awareof legalities associated with divorce or separation but the best part is that they are also very good in handling sensitive issues.